LabVIEW is an awesome product created and maintained by National Instruments. It consists of systems engineering relating to test, measurement and control of instrumentation, devices and machinery, and it is currently used worldwide in numerous applications. Rather than endless lines of textual coding, LabVIEW has a simple graphic interface where devices such as an oscilloscope can be entered into the user’s computer and controlled remotely. This is accomplished by means of VISA (Virtual Instrument Software Architecture) drivers, adapted and augmented by National Instruments for the application and downloadable into the user’s Mac, Windows, Unix or Linux operating system from the National Instruments website. LabVIEW front panel and block diagram can be tiled in the computer screen so that they are displayed side by side. National Instruments was founded by three computer specialists in a family garage in Texas. First projects included a fuel pump credit card system and a specialized waveform generator for the U.S. Navy, in addition to a general-purpose interface bus (GPIB) board capable of connecting instruments to IBM PC’s. A breakthrough came in the early 1980’s when, working with the Apple Macintosh, the innovators connected to Apple’s innovative graphical interface. This quickly evolved into a new creation: LabVIEW, released in 1986. Rather than laboriously typing text-based code, this graphics software allowed developers to wire together icons representing pre-programmed blocks of code. Using a computer mouse, technicians could draw on-screen lines, which became virtual paths as required to connect instrumentation for research and educational projects, prior to prototyping new products or part of a maintenance protocol. LabVIEW is cross-platform, connecting to and integrating Windows, Mac, Unix, Linux and other operating systems into instrumentation or machinery in diverse applications. User interfaces, called front panels, constitute virtual instruments (VIs), each of which also has a block diagram and connector panel, which joins other VIs. In the front panel are controls (inputs) and indicators (outputs) that display the results. The back panel contains the source code, which is displayed as terminals relating to objects that have been located in the front panel. Structures and functions, as they are known, also appear on the back panel, performing operations on controls and supplying data to indicators. All controls, indicators, structures and functions appear as nodes on the front panel, and on the back panel they are connected using drag-and-drop wiring. Functioning inputs and outputs are accordingly defined in the front panel. To use LabVIEW to connect an instrument such as an oscilloscope to a computer, VISA drivers must first be installed in the computer. VISA enables configuration, programming and diagnosis of instrumentation systems that have GPIB, VXI, PXI, serial, Ethernet or USB interfaces. VISA is the generic open-source version of this widely used software. Various organizations have developed and released versions of VISA that are optimized for their unique products. Examples are Tektronix’s TekVISA and National Instruments’s NiVISA. This question arises: If, for example, TekVISA drivers are loaded into a MacBook Pro and one wants to load NiVISA drivers into the same computer for a different application, can they co-exist? Also, will one set of drivers serve for both applications so that the other does not have to be downloaded? The answer is that TekVISA works only for Windows OS. One version of NiVISA works for MacOS. 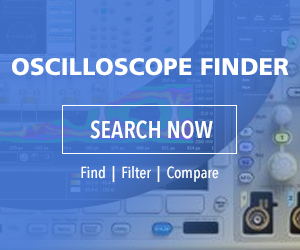 A Tektronix MDO3000 Series oscilloscope, for example, is compatible with NiVISA. LabVIEW is used for data acquisition, instrument control, and industrial automation. It begins to execute only when sufficient data becomes available. How this proceeds is based upon the block diagram in which the wires have been drawn. Variables are propagated through these wires that connect probes when all input data has been conveyed. If multiple nodes reach a point simultaneously, as in many networks, conflicts are resolved by means of parallel execution. To connect an instrument such as an oscilloscope to a computer with a Mac, Windows, Unix or Linux operating system, if they are not already in place, there are three requirements to get started: The oscilloscope must be cabled to the computer, using either USB or Ethernet medium; The correct NiVISA drivers for the operating system must be downloaded into the computer from National Instruments website (www.ni.com); and the LabVIEW program must be obtained from the National Instruments Website. To summarize, LabVIEW is a graphical programming interface that uses C to implement connectivity between a computer and the user’s oscilloscope or any of a vast number of third-party instruments. However, you don’t need to know how to program in C, which remains invisible and behind the scenes, if you become adept at using LabVIEW’s graphical concepts in conjunction with basic computer configuration techniques. To see if you can succeed in the LabVIEW environment, you can download the free seven-day evaluation version of LabVIEW Professional and use it to connect your oscilloscope to your computer.